I am glad you raised this issue. I honestly don't know what Brookhaven is thinking by even approving these ventures. North Druid Hills is a veritable parking lot every morning and every afternoon as it is. Do you think this will at least raise the property values in the area? I also would like to add that when you have a sick child in the hospital or are going to visit a sick child, the last thing you are thinking of doing is getting on the bus. Further, your schedule of coming and going is not exactly predictable enough for public transit if you are visiting a loved one. Oh wait you need me here longer but I must leave to catch the 44? Come on! For all of these Marta stompers, realistically, how would you like to get on public transit so sick you need to be at the hospital? We need to use a bit more common sense in some of these posts. Public transit is not a cure all for all instances. Repeat: it is not a one size fit all, cure all for all instances. The businesses that are being built are hospital and sports centers - both facilities for people that are ailing and visiting those that are ailing. This does not exactly align with treking to and from by bus. I also suspect most of the (very few) people that are suggesting the people that come in from all over the metro suddenly find a marta line that will allow them to get their children to the area schools have not personally had responsibility for getting a child to school every day. This type of comment is one of naivete to me and is probably a man who does not have primary responsibility for actually getting children to school. It is hard enough to get a child to school everyday with a car. Public transit layered on that? Seriously? If they were going to promote any type of public transit, the only kind I could see is an elevated rail line. We have that in Chicago - it allows the car lanes to remain in place while adding a layer of transit. Why doesn't Atlanta have this? Then there is no argument regarding taking car lanes or not. Simply build an elevated line and be done with it. I live in the area and am literally really afraid about what is going to happen when these businesses come. Briarcliff, Lavista, Clifton Road, Buford Highway, Clairmont and North Druid Hills are already extremely nasty in the mornings and afternoons. Last edited by LovelySummer; 02-12-2017 at 02:22 PM..
For all of these Marta stompers, realistically, how would you like to get on public transit so sick you need to be at the hospital? We need to use a bit more common sense in some of these posts. Public transit is not a cure all for all instances. Repeat: it is not a one size fit all, cure all for all instances. The businesses that are being built are hospital and sports centers - both facilities for people that are ailing and visiting those that are ailing. This does not exactly align with treking to and from by bus. If they were going to promote any type of public transit, the only kind I could see is an elevated rail line. We have that in Chicago - it allows the car lanes to remain in place while adding a layer of transit. Why doesn't Atlanta have this? Then there is no argument regarding taking car lanes or not. Simply build an elevated line and be done with it. I live in the area and am literally really afraid about what is going to happen when these businesses come. Briarcliff, Lavista and North Druid Hills are already extremely nasty in the mornings and afternoons. To your first point, of course not. The comings and goings of patients and their families are entirely unpredictable and public transportation would ill suit their purposes. I'm really more focused on how to get the workers to and fro in an employment center that will be that massive. I bolded your statement regarding an elevated rail line as it is a topic worth further discussion and really merits its' own thread. As to whether or not this will have a positive effect on property taxes, I don't think it will be a harm. Emory kept the surrounding neighborhoods stable through times when other DeKalb neighborhoods were feeling the effects of suburban flight. Having said that, local neighborhoods are about at their breaking point already over the traffic situation (I reside part-time in one of them), so I really can't fathom what's to come. I don't think it will harm property values either. My focus is really on whether it is likely to raise property values. If we are going to have to deal with the traffic, I'd at least hope the values go up in North Druid Hills. Possibly catching up to Druid Hills or at least approaching would be nice. I'd consider that a fair trade. All of this really makes me wonder why they never instituted any decent alternatives at the Perimeter near Northside Hospital. That is another area that could use an elevated rail line, if they were going to think of adding anything else. Reducing vehicle capacity would increase person capacity, though. We MUST move away from this notion that roads are there to move as many cars as possible. The reality is that they are there to serve as many PEOPLE as possible, and trying to do everything with cars is just not going to work. A single car lane can move 2000 vehicles per hour at capacity. With an average occupancy rate of 1.2-1.7 people per vehicle, that means that some 2400 to 3400 people per hour can be moved. If the road is over capacity, then that number is significantly less. 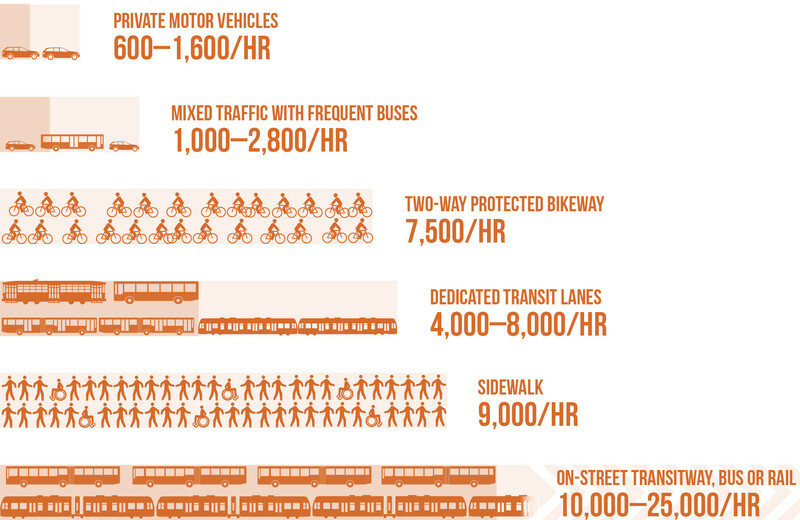 Dedicated transit lanes, with an articulated bus coming every 5 minutes, could move 1476 people per hour. At every 2 minutes, a lane could move 3690 people per hour. As for the 'usefulness' of these lanes, I call BS on your notion that they wouldn't serve schools. See my earlier post about doing this crazy thing called walking, biking, and riding the bus. How many people do you know who use mass transit (not the yellow bus) to get kids to schools that aren't near a MARTA stop? At two schools we've been at that don't have school transportation, I can think of a grand total of 3. And two of them were special needs and have paratransit. How many parents take a MARTA bus with their kids to school and then go on to work from there? Your imagination that buses work for everyone is just not reality. I think this is very true. And its a looooong rush hour. It doesn't end until after 9 and starts around 3. Emory has been very vocal about the strain on Egleston caused by what you mentioned here. This is employment that will be moved from a future rail line (Clifton Corridor) to an area not near rail transportation. But Clifton Road is nearing a breaking point even if they had space to grow. We avoid Clifton Road through Emory except at night. CHOA's parking facility is sometimes full. Its a hassle for patients. There were plenty of people who would ride the bus or walk from the train station to Grady when I went there. There still are, likely. You specify 'not near a MARTA stop', but the obvious answer is increase the number of stops / bring stops closer to the schools. Adding a backbone of Bus Rapid Transit (and eventually light rail) will only make those additional route more useful. If they then don't even consider that to be an option, then they'll be stuck as part of traffic, and hopefully the sight of a bus rolling by without being stuck in traffic will help change their mind. To the bold: it's ironic that this is your summary of my views, as I constantly must tell others that this is not the case. What I AM suggesting is that adding buses in the manner that I suggested is better than not. They're not for everyone, and not for everything, but not even having the option is so much worse. We can ALREADY see what treating the corridor to ONLY cars has done. It's, and this may come as a surprise, has only brought traffic. If we want to fit more people through an area without perpetually widening roads, then we MUST allow for alternatives to exist in the same corridor. That means bikes, walkers, and buses should be given higher priority to incentivize their use over space inefficient cars. I disagree heartily with your last sentence. I am all for improving our bus system, but not at the expense of lanes for cars--hence the sense in lovelysummer's proposal for raised rail. I see a lot of empty buses as it is. I don't think buses make sense for most of the traffic I see. The schools I've mentioned are niche privates that draw from huge areas--those that can walk or bike or carpool already do. The trucks (everything from UPS to plumbers to florists to box trucks delivery goods), salespeople making multiple calls, the list goes on of those for whom buses don't work. Most of our lives are not a one-stop 9-5 job anymore. I think that's why you're seeing resistance to sacrificing lanes for buses. Then you'll need to dedicate more land. Even for elevated rail, which will be killed in a swarm of NIMBY lawsuits, there will need to be additional land used to widen the corridor to allow room for the supports. Either dedicate existing road space for more space-efficient alternatives, or get more land to expand the right of way. Not everyone who could get away without driving are, in part because the alternatives really aren't there. Is it any wonder why people don't bike if there aren't lanes? Is it any wonder why people don't take the bus when it only comes once an hour? Again, ADDING alternatives will allow more people to actually have the option. As traffic continues to get worse, those alternatives will attract more people to use them.